« Are You Ready to Smile Again, Valrico? Tampa dental techniques and materials have advanced to a point where total and near-total mouth reconstruction is possible right here in the Tampa area. You have probably heard around Tampa about dental implants; the tooth replacement option that is, in most cases, the best possible replacement for a missing tooth. 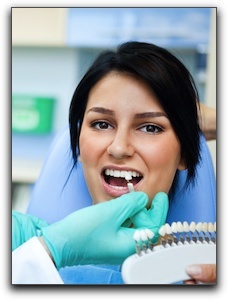 Dental implants have been used in Brandon and Plant City for many years to replace one or two missing teeth. However, they can also provide a structure for dental crowns, bridges, and anchored dentures that replace nearly every tooth in the mouth! ‘Linda’ was a 52 year-old Valrico patient with a mouthful of problems. She was missing most of her back teeth on both her upper and lower arch. Four of her front teeth were chipped and her gums had eroded revealing the metal bases of two old crowns. This entry was posted on Thursday, February 24th, 2011 at 7:48 pm	and is filed under Cosmetic Dentistry. You can follow any responses to this entry through the RSS 2.0 feed. Both comments and pings are currently closed.